Computer science is (almost by definition) a science about computers -- a device first conceptualized in the 1800&apos;s. Computers have become so revolutionary, that it is difficult to think of our lives today without them. That said, algorithms are much older and have existed in the world for millennia. Incredibly, a few of the algorithms created before the Common Era (AD) are still in use today. 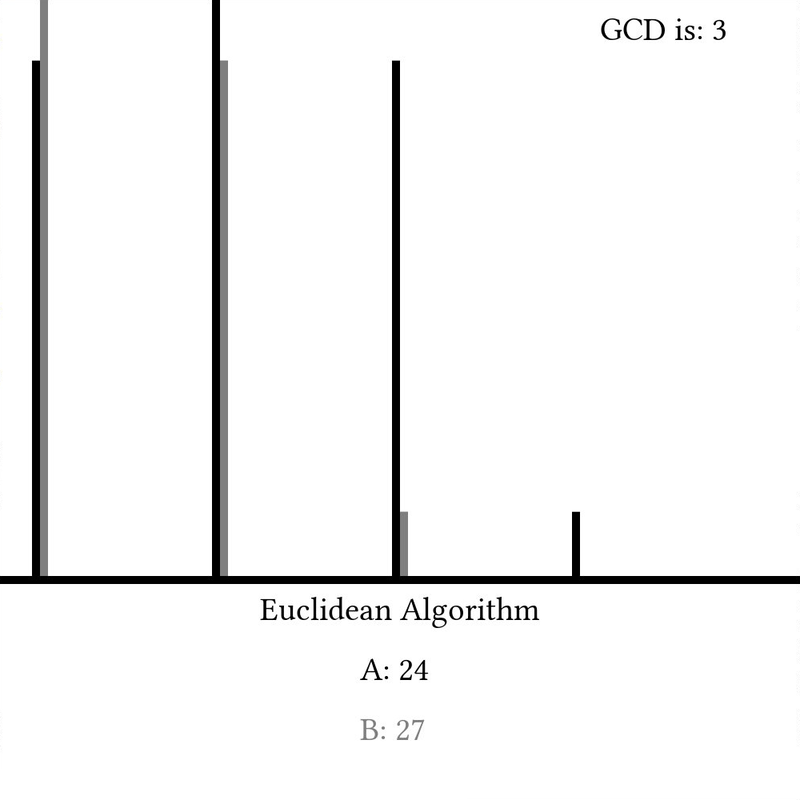 One such algorithm was first described in Euclid&apos;s Elements (~ 300 BC) and has come to be known as the Euclidean Algorithm. a := a - b.
b := b - a.  Use  (returns the absolute value) to support negative numbers. BOTH SAEM NUM1 AN NUM2, O RLY? DIFFRINT NUM1 AN SMALLR OF NUM1 AN NUM2, O RLY? a, b = b, a%b until b.zero? b := a % b. BOTH SAEM NUM2 AN 0, O RLY? 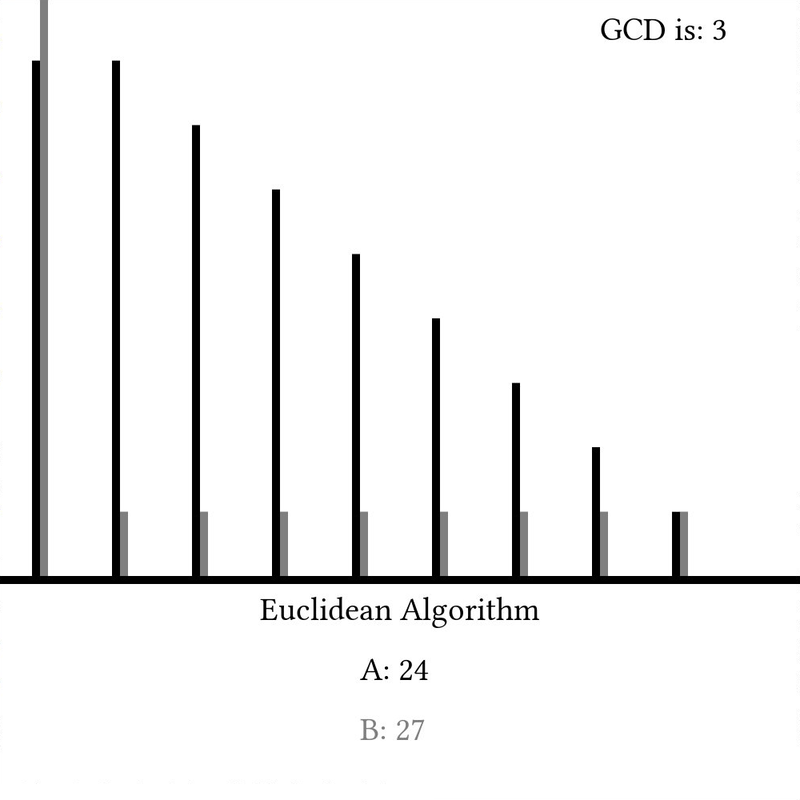 The Euclidean Algorithm is truly fundamental to many other algorithms throughout the history of computer science and will definitely be used again later. At least to me, it&apos;s amazing how such an ancient algorithm can still have modern use and appeal. That said, there are still other algorithms out there that can find the greatest common divisor of two numbers that are arguably better in certain cases than the Euclidean algorithm, but the fact that we are discussing Euclid two millennia after his death shows how timeless and universal mathematics truly is. I think that&apos;s pretty cool. Transcript show: ((64 * 67) euclidSub: (64 * 81)). Transcript show: ((128 * 12) euclidMod: (128 * 77)). A text version of the program is provided for both versions. pointer                 BA          // If a ≠ b, the DP should change one clockwise, otherwise, go straight ahead. pointer                 BA              // If A > B, DP goes one clockwise, otherwise, DP stays the same. out(number)             -               // Print out A when done. The image "Euclidsub" was created by James Schloss and is licenced under the Creative Commons Attribution-ShareAlike 4.0 International License. The image "Euclidmod" was created by James Schloss and is licenced under the Creative Commons Attribution-ShareAlike 4.0 International License.